With seemingly endless venue options to choose from for your wedding ceremony and reception in Barbados, it's hard to narrow down your choices and select "the one." Barbados offers a range of idyllic locations for a special celebration. The stunning, tropical surroundings epitomizes most couples' idea of a dream wedding or honeymoon destination, framed by white sand beaches and clear blue waters. The natural simplicity of a tropical hideaway, combined with the luxuries of a modern beach residence, guarantee a blissful and memorable wedding experience. Luckily, we did the legwork and scoured the island and spoke to wedding planners to compile a list of wedding venues you should give some serious consideration when it comes to planning your big day. From quaint retreats to historic venues and sweeping spaces, we have a venue for every single type of couple. 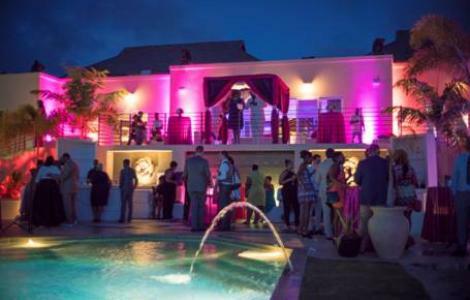 As a leading provider of private holiday villa weddings in Barbados, we specialize in transforming any one of the exquisite luxury villas in our portfolio into the perfect, romantic wedding venue. Choosing a luxury holiday villa as a wedding venue not only ensures a stunning setting, but also provides the ultimate in privacy and exclusivity. Whether catering for a handful of guests or a full wedding party, a luxury holiday villa affords couples the added benefits of a truly personalised event. This means the bride and groom, as well as their family and guests, will take home special memories of a perfect day in paradise. Villas from West Coast Villas include Nelson Gay and Sandalo. Harri Smith Beach is a beautiful bay with powder white sand, perfectly cut into the cliffs of the Atlantic’s rugged coastline. The beach is scattered with tall coconut trees and has a shallow lagoon protected by the reef, so the waves do not usually reach the shore. This quiet little cove is the idyllic romantic hideaway for couples looking for a small, intimate beach wedding ceremony and celebration. Above the bay is the derelict Harrismith plantation, which is a stunning backdrop for creative wedding photos. Gun Hill Signal Station was built in 1818 and provides magnificent and captivating views of the entire island. The site was recently renovated and updated as an events venue, with beautifully landscaped gardens with tropical flowers of every colour! The signal station beckons you up the winding path, past historic lamps and tempting garden benches, to behold the panoramic views. Set high above the East Coast of the island, the Farley Hill National Park offers breathtaking scenery, set in the grounds of the once regal Farley Hill house. A mansion in ruins, tucked away in a forest of mahogany trees, high up on a hill overlooking the rugged Atlantic coast, Farley Hill is an ideal spot for a wedding ceremony and celebration. St Nicholas Abbey is one of the last remaining Jacobean style houses is the world and the house retains its charm from the days of the former sugar plantation. This beautiful, intimate venue is a photographer’s dream and is perfect for weddings with 100 people or less.